TDX Laptop Stereo Card – Progressing..
Well finally hit some good headway with this tonight and have a fully working circuit with dual channels and volume control and works happily with headphones. This uses the base of the original circuit (as per the FAQ) but removes the 2nd stage op amp and introduces 2 x LM386 power aps and 2 x DS1669 Digital Pot ICs. There are 2 push buttons that control up and down volume. Massive thanks to Michael Mahon who has been very patient with me over the last couple of weeks :). 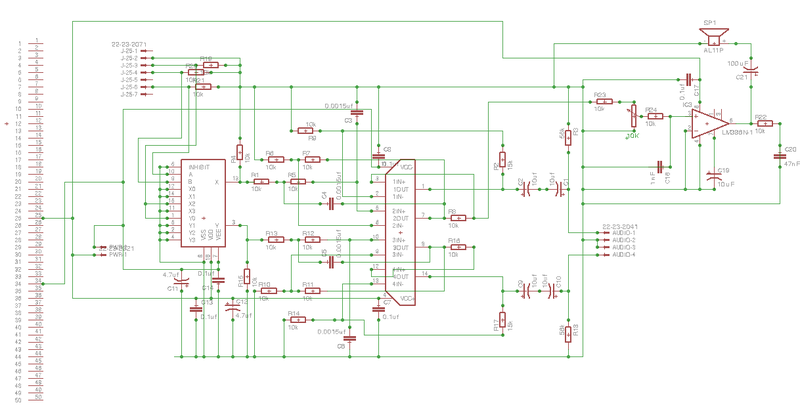 Still have quite a bit of work to do as I also plan to look at other ICs that might be able to simplify the design..as currently the power amp section requires 4 ICS…. Well I plan to do a small run of the version 1.0 card (15 cards or so and will be offered to the CSA2 community first). The output is designed to go via power speakers. My website will get updated at some point to reflect availability :)(www.drew2gs.com). I have stopped working on getting input functionality working, but rather have decided to focus on making a card that can fit in the portable GS that is being made by http://www.a2gs.com. The portable GS will need to be able to run via headphones or un-powered internal speakers. This means I need to redesign the existing card to contain power amps. 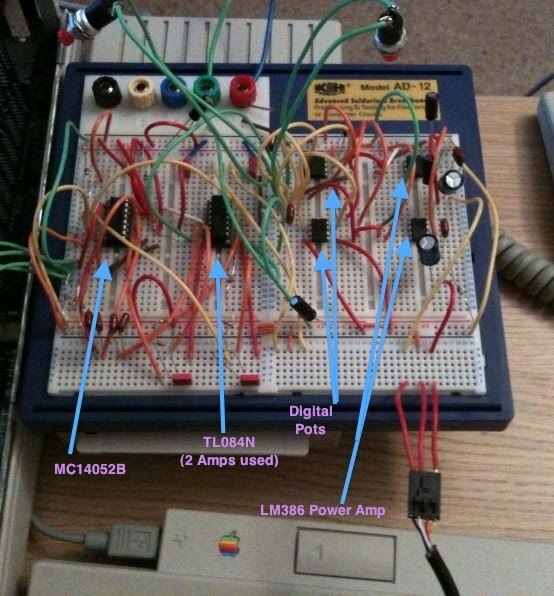 This has also made me think that once I get input working I can make a version 2.0 stereo card that has Line-out, headphone-out with vol control and Line-in/Mic-in. There is potential here to obvious make a completely slotless design. Well tonight have had 100% success getting headphone output to work with volume control and zero distortion :). This happily worked along side the line out with no obvious issues. Was only able to test one channel as currently only have 1 potentiometer. To get it to work successfully I bypassed the 2nd OPAMP. There is still hiss/white noise which I am not happy with until I have eliminated the bread board, but am going to continue with the current design. I will use a version 1.0 board along with a hand made board to see what it all sounds like before i start looking at layout and how to get it to a size the portable GS guys are after :). 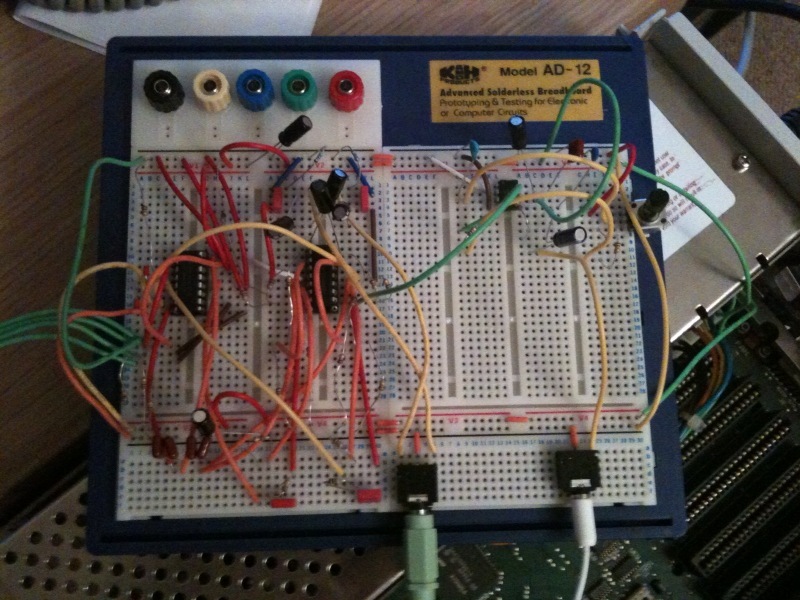 Working breadboard (one channel powered) utilising bother lineout and headphone out. You are currently browsing the Drew ][ blog archives for December, 2009.